A new and colourful band of musicians in which the unique expertise and musical background of every member is brought on the table. The mixture of this illustrious sextet leaves no musical style unaffected.on the contrary: JamaicanJazz is being mashed with Jamaican ska, latin, reggae, speedy surf-parts and ragged rock. 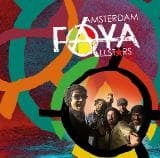 To sum up: Amsterdam Faya Allstars is as colorful as the city is nowerdays. Limited edition promo teaser ep for their upcoming debut full length!